Happy Valentine's Day friends! I hope you have fun plans with family and friends you love. I'll be helping with the Valentine's Day party at my son's preschool this afternoon. This evening, my man and I will be enjoying a night in with our boys. We'll be having the best St. Louis pizza, Imos, which comes in a heart shape on Valentine's Day. Fancy, I know. Many people think Valentine's Day is over commercialized-- and I agree, but it can still be fun to celebrate at home and at school. 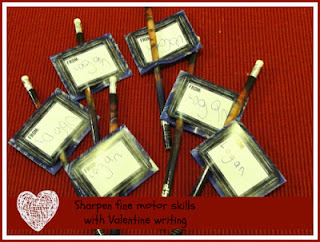 Helping kids see Valentine's Day as a time to share kindness and to say or write loving words is wonderful! If You'll be My Valentine is a perfect book for focusing on kindness this Valentine's Day. In this sweet story by Cynthia Rylant, a boy creates personalized Valentine cards for those he loves. He also does something kind for each of the people. The text layout is wonderful for early readers. The left side of the page has a rhyming verse with a small picture of a handmade card. The right page has a large clear picture of the boy exhibiting an act of kindness. This book inspired us to share some kindness to others. We have been busily writing cards (great for fine motor practice) and crafting creations to give to Grandparents, friends, and cousins. One fun way that we learned to make hearts for our cards was to create rubbings with Sandpaper. 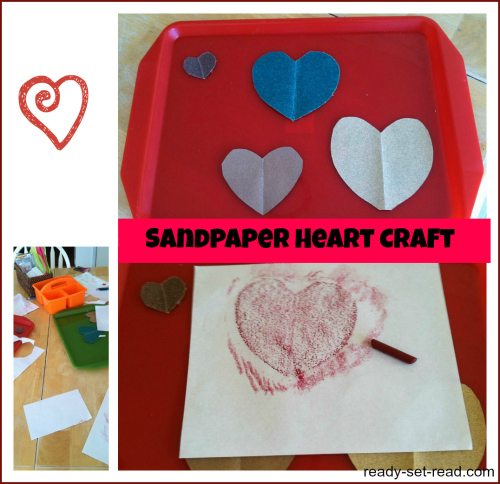 I cut the hearts from the sandpaper and taped them to a tray. The boys put white paper over the top and rubbed with the side of a crayon. Voila! Then they cut and glued and decorated. They came up with some cute cards! You can find all of our card ideas and inspirations on my Valentine's Day board on Pinterest. Like the boy in the story, though, we didn't want to just give cards. We also wanted to participate in showing kindness to others. Today is also International Book Giving Day. We had a very special delivery of books to share today. When we have visited our pediatrician's office lately, we've noticed that the books in the office are "well loved". My boys can't resist a good book, but they get so frustrated when they are in the office reading a book and half the pages are torn out. We gathered up a bunch of books and will bring them in to share. My baby has a check up today anyway! The boys are excited to share these books with other kids, and also will be excited to "visit" their books when they go to doctor appointments. It's a fun to celebrate Valentine's Day with the boys and to teach them to think of others! 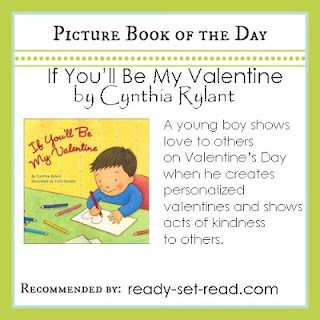 If You'll Be My Valentine by Cynthia Rylant is the book I chose to share on my facebook page for the Picture Book of the Day today! Like my page for a picture book suggestion each day. I'm teaming up with several other bloggers to bring you the best recommendations in kid lit. Wonderful, once again. I love books by Cynthia Rylant, so how did I miss this one until now? I was always buying rubbing plates and they never did what I wanted, sandpaper is so good to know about. Your boys are getting one terrific education! It is nice they are doing service projects at such a young age. We gave books to our pediatrician's office for Int'l Book Giving Day too! And to our preschool. And on another note the heart shape pizza sounds super cool! What a lovely collection of ideas and books for Valentine's Day!